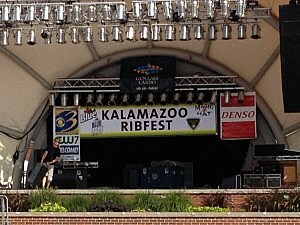 Country star Craig Morgan and rockers Blue Oyster Cult headline the just-announced 2015 Kalamazoo Ribfest entertainment lineup at the Arcadia Creek Festival Site in downtown Kalamazoo. Morgan, whose “Red Neck Yacht Club” and “That’s What I Love About Sunday” lead a string of chart-topping country hits, will perform on Saturday, Aug. 8. Performing Friday, August 7 at Ribfest will be rock and roll’ers Blue Oyster Cult. From “Don’t Fear the Reaper” to “Burnin’ for You”, BOC’s music is riff-heavy and head-banging while intelligently hook-laden. Leading off on Thursday night, August 6 will be young country newcomer Chase Bryant. Bryant’s heritage is defined by music. His upbringing (his father, Jimmy, played with Roy Orbison), his craft, his inspiration and his obsessions are all centered in the same – which is good – because there’s no other way to explain how a 22-year-old Texan could already be a top-flight guitar player, head-turning songwriter.